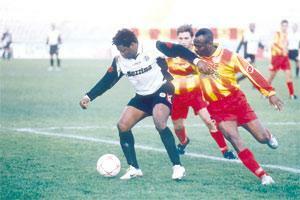 Hibernians` Ndubisi Chukunyere (left) holds off Birkirkara`s Precious Monye during the second round match. Sliema Wanderers' bright prospects of retaining their status as the no.1 team in Malta will be further enhanced this evening if they emerge top from the Old-Firm derby. All of the three title candidates will be engaged in arduous tests but the head-to-head confrontation between title aspirants Birkirkara and Hibernians, second and third respectively in the table, could leave either bid in serious jeopardy in the event of defeat. These title hopefuls will have a clear picture of the situation at the top of the Premier League tree before their direct clash as first in action this evening at the National Stadium are Old-Firm rivals Sliema and Floriana (kick-off 6 p.m.). The 10-point margin between the two antagonists and the Blues' perfect record in matches against the Greens this season inexorably hints at another three-pointer for the leaders but the Greens have shown time and again that they can hit hard when least expected. "First things first," Edward Aquilina, the Sliema coach, replied when I suggested that today's games could supply a broad indication on the destination of the title this season. "Our chief priority is to win our games and then, whatever comes from the matches of our rivals would be a bonus," Aquilina said. "This is a derby and Floriana will certainly try to make life difficult for us. They can be dangerous opponents as they have shown in many matches this season. I watched their game against Hibs on Sunday and in spite of their defeat, Floriana had their good moments. Having said that, I also believe that we have enough ammunition to see off their threat," Aquilina remarked. Sliema's power will be greatly bolstered by the return of Joe Brincat. The veteran midfielder missed the 2-1 victory over Pietà Hotspurs because of flu but has been certified fit to face his former team. Floriana have skipper Claude Mattocks on the sidelines due to a hamstring injury but otherwise Ziya Yildiz can bank on a full complement. Brazilian forward Edoardo Do Nascimento, Bizu, is expected to earn a starting role after playing 45 minutes of his side's 3-1 upset against Hibs. "Every game is a derby in the Championship Pool," Yildiz said. "It's a well-known fact that Sliema have the strongest squad in the Premier League but we have to concentrate on our strength. "It's always difficult to play against Sliema because they are very talented at keeping possession and have players who are among the most experienced campaigners in Maltese football. We definitely have to be at our best to entertain hopes of gaining something from this match," Yildiz said. Previous results - Sliema W. vs Floriana 4-1, 2-0. The outcome of today's Old-Firm clash is bound to weigh heavily on the minds of the players of Birkirkara and Hibernians as they prepare to leave the dressing rooms for their encounter, kicking off at 8. Stephen Azzopardi, the Birkirkara coach, acknowledged this when he said: "The result of any match played by Sliema at this stage is always inclined to have an influence on my players' frame of mind. Sliema's 2-1 win over Pietà on Saturday took them six points clear at the top before we played Marsaxlokk. Their victory intensified the pressure on us as we required a victory to keep in touch. "The same can happen today. If Sliema beat Floriana, both Hibernians and we will be under more pressure to deliver as a defeat could have serious repercussions on our title challenge." Roderick Briffa and George Mallia are still unavailable for Birkirkara but Lino Galea has trained regularly and is back in frame for today's clash. Azzopardi is also heartened by news of Mallia's return to training this week which could see the international midfielder making his comeback in the team's following fixture against Floriana. "Knowing that this game could prove to be crucial to our title chances, we will certainly do more than our best to take maximum points," Azzopardi said. "Our recent performances give me good cause for optimism. "The team seems to have recovered from that slump in the second round of the campaign. We have always believed in our capabilities of challenging for the league crown, even when results were not coming our way. "There was never a crisis at Birkirkara... yes, everyone was disappointed because we knew that the results were not doing justice to our potential, but we did not panic. We just reflected on the situation and tried to rectify matters on the training pitch. Now the enthusiasm has been rekindled, the morale is high and I hope our season continues to flourish." Like Azzopardi, Hibs' mentor Robert Gatt is buoyed by his team's performances of late. "Our form has improved steadily and that is a good omen," Gatt said. "Some of our key players were not performing to their standards due to fitness problems but they have now gained more match practice which in turn helped them return to their usual form." Towering centre-half Aaron Xuereb is ruled out of today's match by suspension but otherwise, Gatt has no selection problems. As for the high stakes involved in today's game, Gatt said: "We are looking no further than to keep up the pace with the front-runners. "Our objective is to maintain our title challenge till the end and to do that, we have to remain in the top pack. I am confident in our chances against Birkirkara but one thing is certain... we can only obtain the three points with a good performance." Previous results - Hibernians vs Birkirkara 4-2, 2-1. Playing on Sunday at the Hamrun Ground - 1.45 p.m. Hamrun Spartans vs Msida St Joseph; 3.45 p.m. Marsaxlokk vs Pietà Hotspurs.